Don't panic! The sea "tragedy" in Leyte captured on video that's making rounds on Facebook wasn't really tragic. Read more to know why. 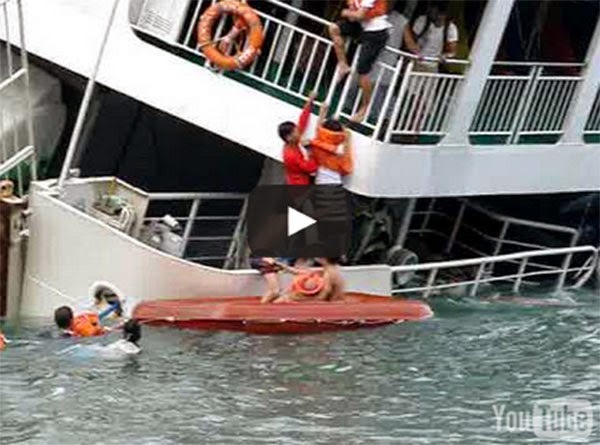 Recently, several pages on the social networking site posted a video of a sea mishap, describing it as "malagim na trahedya." The location where the accident occured was said to be San Ricardo Port in Southern Leyte, but the posts did not include the date. The video has gone viral. In fact, it has garnered over 200,000 views and more than 10,000 shares as of this posting. It turned out that what they called a "tragedy" wasn't tragic after all. A certain Mike Ott first uploaded the material on YouTube on August 5, 2009. He said the video is about the Ocean King II liner that capsized off the shore of Barangay Benit in San Ricardo town in Southern Leyte on July 28, 2009 with 121 people on board. The vessel, an inter-island roll on-roll off (Ro-Ro) ferry, was leaving for the Port of Lipata in Surigao when it turned on its right side near the San Ricardo Port. The passengers were wet, but no lives were lost. So why do several Facebook pages titled it "malagim na trahedya?" The objective is obvious: to attract attention and get more likers.